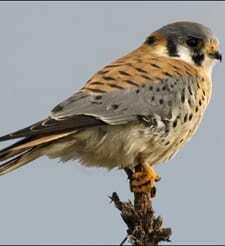 North America’s littlest falcon, the American Kestrel packs a predator’s fierce intensity into its small body. It’s one of the most colorful of all raptors: the male’s slate-blue head and wings contrast elegantly with his rusty-red back and tail; the female has the same warm reddish on her wings, back, and tail. Hunting for insects and other small prey in open territory, kestrels perch on wires or poles, or hover facing into the wind, flapping and adjusting their long tails to stay in place. Kestrels are declining in parts of their range; you can help them by putting up nest boxes.